I have compiled 50 math activities that i can use in the classroom. I have uploaded 20 of those files but have more in a binder. Some of the activities use movement in them. i believe that when students can move and learn at the same time it is very beneficial. Knowing how much things are worth is a skill that you need in life. Being able to give change is essential when buying or selling goods. this lesson focuses on teaching students how to count the correct change through games. During my time at VCU i video taped myself teach a calendar lesson in a kindergarten class. Calendar is a great for incorporating math skills to students. the students learn the days of the week as well as the months during this time. This is also an easy way to introduce some of our five sense. I conducted a math interview in a first grade class with two different students. Durning the interview i asked the students to show me different ways that the same number can be represented. through doing this i got insight on how different students think of numbers. This is a week long unit plan on Money for first graders. in this unit we give the students an opportunity to work with real money as well as learn about whose faces and what places are on coins. we also got to discuss equivalencies and why money is important for every day life. The students got to play store and learn more about the importance of saving money. below you will find the attached unit plan. During my math interview, I got to learn a little bit more about how children think about math. I got the opportunity to watch children think and the steps they take to solve problem. The game that we played was called “Counters in a Cup”. In this game, you solve how many counters are under a cup based on the original number and the amount of counters still visible. I talked to the children in my group about subtracting and adding counters. We put some counters on the table and counted them out when the children could solve the problem together and talk about it, they came up the correct response faster. I got to see how different children think about ways to solve the problem. One of the children were very god at putting the number of fingers up and counting down to get the response very quickly. The child could also do some of them in his head as we went on in the game and he got the hang of it. Another student had a hard time getting the correct number of counters to fingers. I feel that working with this child gave me a little more understanding as a teacher ad how to help a child who I struggling in a topic. When working with children that hare having a hard time with a subject it is important as a teacher to stick with the child and assure them that we will figure it out together and to be patient with children. 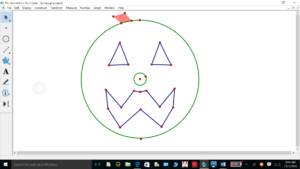 The directions below will instruct you how to make a pumpkin on sketchpad. Sketchpad is good to know how to use in and elementary class because it can help you teach children about angles and lines. Next make a triangle on the top left corner of the circle. Make a line from the center of the circle to the top of the circle. Next mark that line as a mirror. After take the pointer tool and click on all sides and corners of the triangle. Reflect the triangle across the mirror line under the transform box go to translate. Now you should have two triangles for eyes. Now make a line going from the bottom of the circle to the middle. Use the construct polygon to to make half of a mouth. Using at least 6 different line segments. Now using the pointer tool click all sides and corners of the shape you made. Reflect the image. Now you should have what looks like a mouth! Now hide the line segments you marked as mirrors. And hide the center line segments that meet in the middle of the mouth. 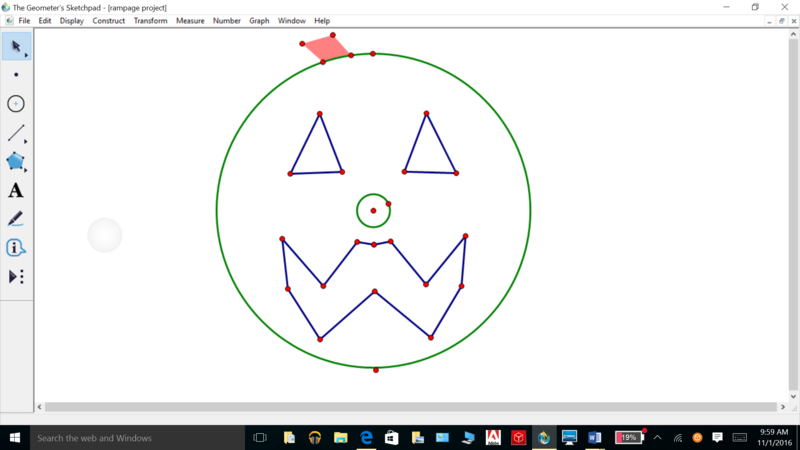 Now us the construct circle tool to make a nose in the center of the circle. After on the top left outside of the circle make a stem for your pumpkin! After just hide the line segments you used for your mirrors. a) The program has made it easier to make shapes and see exactly what the angles are to the shapes. And measuring the side to see how they move has made it much more clear. Also it makes translations reflections and rotations easier to understand. b) The uses could be showing kids how to make shapes and how to measure sides. I could show the kids on the projector how to use it. Giving it to kids it may be difficult to do. c) I like how it runs but I think it could have better directions on how to do something’s. When we would do the homework if it didn’t have the side bars I don’t think I could have figured it all out as easy.